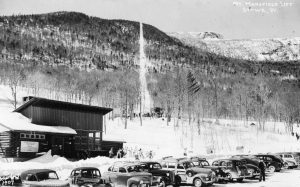 However the demand created by the new chairlift meant the state had to enlarge the parking lot the following year! To help defray the cost, the state instituted a parking charge for what is now the Mansfield lot. So what did the state charge for parking? Kenmore Commoss and Norma Stancliffe both had the answer that parking cost 25 cents per car. I also heard from local historian and Mount Mansfield Ski Patrol member, Brian Lindner, who has an unfair advantage. Brian’s father was the state employee in charge of the Mount Mansfield State Park and their family lived in what is now the Mansfield Base Lodge. 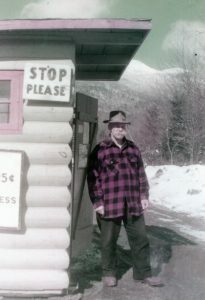 From 1945 to 1960 Brian’s grandfather, Claude Adams, staffed the toll booth and collected the parking fees. Norma Stancliffe’s family was close friends with the Lindners so she spent a lot of time in the base lodge. She remembers as a kid in the 1950s helping Brian’s grandfather count the quarters at the end of the day. So when did they take away the parking fee? Kenmore says they were still charging in 1965 when he started skiing Stowe. He says there was usually a discussion in the car about who paid the fee last time, and whose turn it was this time. Mount Mansfield Ski Club historian Mike Leach routed me to some of the old MMSC newsletters that are available online at the club’s website. 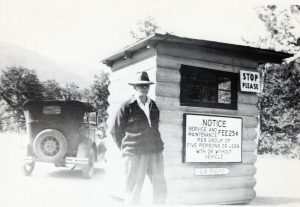 The February 1966 issue had a column indicating that the toll booth had been removed and the state would no longer charge the fee. The state had been receiving as much as $15,000 a year from parking! In lieu of that, the Mount Mansfield Company agreed to pay the state a percentage of the gross revenue from ticket sales. So let’s talk about parking today. Simply stated, on busy days here at Stowe, we run out of parking. We are not alone. My wife and I spent January and February in Salt Lake City, Utah, primarily skiing Snowbird. That meant traveling Little Cottonwood Canyon on an almost daily basis. Every Saturday and powder day both Snowbird and Alta ran out of parking! That was also true for the areas in Big Cottonwood Canyon, Brighton and Solitude! Snowbird and Alta both have special parking for carpools with three or more people in a car. This year Snowbird debuted a phone app where you could arrange a carpool. The Salt Lake City area has mass transit available that does service the ski areas. Your season pass includes a UTA pass that can get you on the bus and there are several ski bus parking lots. And those lots get filled on the busy days also! Well, what about a trip over to Park City? The Friday before Martin Luther King weekend was a powder day. Little Cottonwood Canyon was closed due to avalanche control so we headed for Park City. Traffic was backed up three miles from the Park City exit off Interstate 80. Two and a half hours later we got to the ski area where all the parking lots were full! Park City actually has great mass transit and you can park at the high school or other locations and bus your way to the area. By the way, Park City does have some limited paid parking. I’m not sure how that works. I’ve heard people say Deer Valley has it right in that they limit ticket sales, but they also can run out of parking before they run out of tickets. What about Colorado? On our drive out to Utah we happened to come through the Interstate 70 Eisenhower tunnel at the end of a sunny Saturday ski day. Traffic on the west side of the tunnel was backed up for six miles! A-Basin has announced that it is pulling out of the Epic Pass next year and the reason is …. you guessed it, parking! But the problem isn’t really parking. The problem is traffic!